First up tonight are the support band. Earlier dates on the tour had The Treatment as support, but tonight the support came from veteran rockers New York Dolls. They took to the stage considerably earlier than advertised, but the venue was already pretty busy when they came on. A backdrop limited them to using the front portion of the stage, but this seemed to suit their style anyway. They got a fairly good response from the crowd but their performance did feel a bit lacking to me, and the sight of David Johansen regularly checking a folder of lyrics didnt inspire much confidence. There were plenty of fans dresed up in costumes and horror makeup and before Alice Cooper's set then some of these were picked out to come on stage and be judged for the best costumes - the winners getting cash prizes. Tonight though was all about one man - the legendary Alice Cooper. As soon as the curtain hiding the stage dropped there were cheers and the man himself appeared at the top of a set of stairs with extra spider arms attached and with sparks shooting from his hands at one stage as he sang the opening song, The Black Widow. 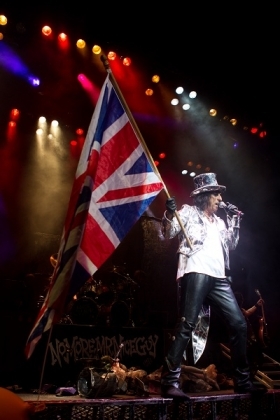 Alice Cooper concerts are more than just singing though - they're a full-blown theatrical performance with lots of costume changes and stage props as well as great music, to make them great entertainment. During the course of the show Alice Cooper performs one song with a large python wrapped around him and at times seems to have to make an effort to adjust its grip to avoid being crushed, later he dons a jacket with the words "New Song" on the back to perform "I'll bite your face off" which is disappointingly the only song from the new album to be featured in the show - I had hoped to hear "Caffeine" as well. Alice's band are on fine form tonight with veteran Steve Hunter joining the band for the tour, and new guitarist Orianthi (the first female in Alices band) putting in an excellent performance. Later in the show during "Only women bleed" Alice sings to a corpse and dances with it (its only a dummy in case you hadn't realised). During Alice Cooper's performance a "photographer" runs on stage and gets in Alice's way as he continually takes photos and brandishes a pass before Alice deals with him by impaling him with a microphone stand before he's dragged off with the mic stand through him and blood pouring from his mouth. Shortly after this two stagehands in executioner outfits race on and wrestle Alice to the Guillotine that has just been brought on stage and strap him in for his only death of the show. Even though you know that can't be his head getting cut off, its so cleverly done the audience is unable to tell how the magic act is done and even after so many years of using the guillotine in his shows it still hasnt lost it's shock value. We get an enourmous monster on stage at the end of "Be my frankenstein" which towers over the band members as it roams the stage. Show closer "Schools out" is an extended version this year with a section of the Pink Floyd hit "Another brick in the wall" being incorporated into the song, and is a great party Alice Cooper style with Balloons filled with glitter bouncing around before Alice stabs them with a sword (rather disconcerting when he does this a foot above your head) bursting them and sending glitter everywhere. "Elected" is the only encore tonight before the night is sadly over - they say time flies when you're having fun and that's definitely the case tonight. Alice Cooper is a true rock legend and puts on some of the best shows around - packed with entertaining theatrics, great performances and packed full of hits. A fantastic night.